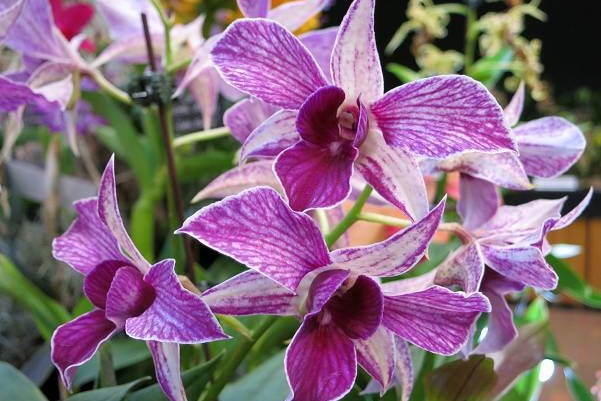 Come celebrate with us on Valentine’s Day as The Southern Ontario Orchid Society presents its 35th Annual Orchid Show. Experience how orchids not only enchant but also possess you. That special Valentine will love these exotic flowers set in fabulous displays in the middle of cold dreary February. RELAX among the artistic displays that fill the Floral Hall. LEARN that anyone can grow orchids at the seminars. Then, SHOP the extensive sales area to enjoy the long lasting flowers at home. No reason to restrict yourself to Valentine red. Go for the mysterious richness of merlot; add the purity of new fallen snow. Then top it off with the yellow brilliance of spring sunshine. Yes, orchids come in all these colours, as well as cheerful mixtures to delight anyone. No need for bottled perfume, orchid scents are incredible. The Southern Ontario Orchid Society is a non-profit organization. For 50 years, members have been sharing their knowledge about growing, breeding, preserving and conserving the vast family of orchids. As a result novices are nurtured to become experts. Proceeds from the show support conservation of orchid habitat both in Canada and in the tropics as well as the Toronto Botanical Garden.